Was there ever a company that worked (exactly) according their businessplan? Because businessplans may kill the creativity, startups used the “Just do it” method. Chaos and creativity leads to excellent products was the thinking behind. In practice, most of the time it did not. To be honest, I faced the same problems with my start ups and product development. A businessplan never worked out, and the hockeystick in the xls was unpredictable when it would start. Me as a “manager” who liked to be in control but understands that you need to give people space to be more creative, was experimenting with it from the beginning of my business career. Not scientifically substantiated experiments but try and see how the potential customer reacts and see how you get the people of your team are better motivated. The problem is that you (as an entrepreneur) think they know what your prospective customer want. Because you are sure you spend months, creating and improving that product without ever showing the product to the prospective customer. It is the main reason that your product fails or at least you wasted your investments and have to invest again. Also Eric Ries recognized these challenges in his startups but he found a more method to avoid the waste in product development. 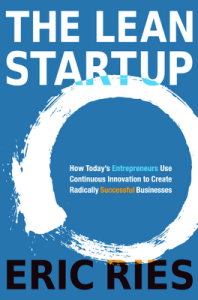 In the book The Lean Startup: How Today’s Entrepreneurs Use Continuous Innovation to Create Radically Successful Businesses, Eric described the method to startup a company lean. It is based on lean manufacturing (from companies like Toyota) is taken as the base for method to start up (technology oriented) companies. Eliminate uncertainty: Using the Lean Startup approach, companies can create order not chaos by providing tools to test a vision continuously. Lean isn’t simply about spending less money. Lean isn’t just about failing fast, failing cheap. It is about putting a process, a methodology around the development of a product. Work smarter not harder: The question is not “Can this product be built?” Instead, the questions are “Should this product be built?” and “Can we build a sustainable business around this set of products and services?” This experiment is more than just theoretical inquiry; it is a first product. Develop an minimum viable product (MVP): A core component of Lean Startup methodology is the build-measure-learn feedback loop. The first step is figuring out the problem that needs to be solved and then developing a minimum viable product (MVP) to begin the process of learning as quickly as possible. Validated learning: The unit of progress for Lean Startups is validated learning-a rigorous method for demonstrating progress when one is embedded in the soil of extreme uncertainty. Entrepreneurship is management: A startup is an institution, not just a product, so it requires management, a new kind of management specifically geared to its context. Validated learning: Startups exist to learn how to build a sustainable business. This learning can be validated scientifically, by running experiments that allow us to test each element of our vision. Innovation accounting: To improve entrepreneurial outcomes, and to hold entrepreneurs accountable, we need to focus on the boring stuff: how to measure progress, how to setup milestones, how to prioritize work. This requires a new kind of accounting, specific to startups. Build-Measure-Learn: The fundamental activity of a startup is to turn ideas into products, measure how customers respond, and then learn whether to pivot or persevere. All successful startup processes should be geared to accelerate that feedback loop. All together, I advice to read the book as soon as you can (click here for more info about the book). As this is more or less the method we were using last years within ContentForces for product development, I expect to write much more posts about the topic and our experience. Besides the idea is to deliver more services to develop your products and services based on Lean Startup. Off course according the Lean Startup method :).